Posted December 8th, 2013 . 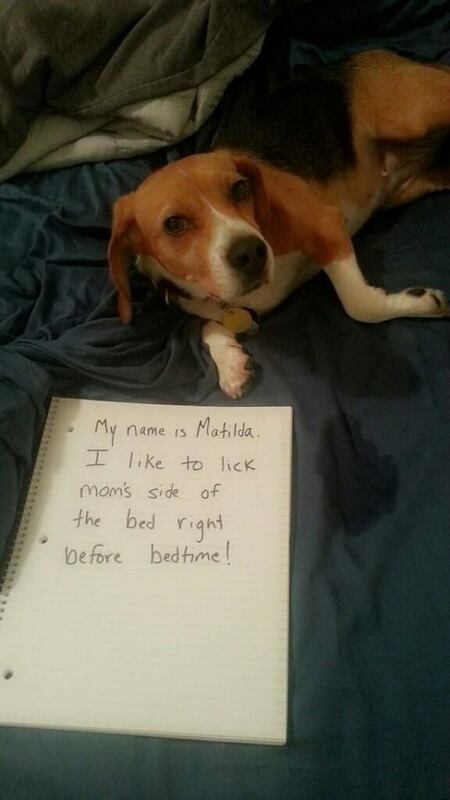 Our beagle Josie does the same thing. She now has her own blanket on the bed to lick. OMG!!! my chihuahua does the same thing!! wonder what it means? My dog does that exact same thing! And will, on occasion, lick my pillow! He is one sick puppy….. I don’t seem what the problem is. Expression of love for mom. Our 3 do the same thing. One of them soaked my side so badly last night that I actually got brave enough to sniff it to make sure it wasn’t pee or puke. Ugh. Guess you got lucky last night ! I have 3 that can’t hold their lickers. Daisey, my long hair dachshund, likes people, my legs mostly, and pillows. My mutt, Mario, licks the sheets, and my chihuahua, Teddy, licks the couch. Weird dogs. Our Corgi loves to lick my husband and his side of the bed. Also likes to lick anyone’s legs after a shower. My pup loves to lick me after I’ve put lotion on or washed my hands. Seems to me like she thinks I’ve gotten something on me and she is cleaning me. Loves to lick herself also on my bed!! LOL Gotta love them! My hound does the same thing with my hands! He absolutely cannot resist the soap, and the Mrs. Meyer’s lavender hand soap seems to be his favorite. He’s quite the soap connoisseur.